On 28th January the children from Schools’ Parliament were invited to take part in an event to commemorate Holocaust Memorial Day. We were honoured to meet and listen to the experiences of three Holocaust survivors and how the Holocaust affected themselves and their families. They were so inspirational and brave and it was a moving and humbling experience. We were also able to view the exhibition in the Town Hall which was very informative and interesting. 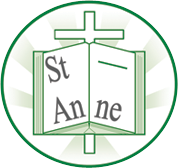 As Always the children were a credit to St Anne’s. Our next meeting is 14th March 2016.